We are delighted to select a chosen charity to support during the year ahead – Freewheelers EVS. Freewheelers are also known as Blood Bikes. It’s rare to see one as they operate mostly at night and weekends – and all run by volunteers! 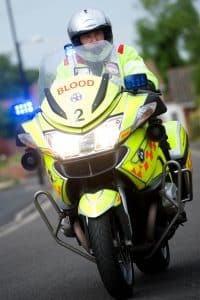 The team of men and women are based all over the South West with blood bike charities all over the UK too. They exist purely on charitable donation with no financial help from the NHS or the government. We are delighted to support them. Matt Sims, Blood Bike rider. Matt went on to volunteer and is now an advanced motorcyclist and fundraiser and rider with the charity. He is also serving as Vice Chairman for a third term. You can find out more about the amazing work done often under darkness at the freewheelers website. You can also make a donation at our open events or by popping into our offices.